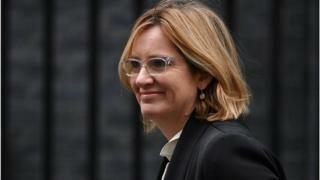 Image caption Home Secretary Amber Rudd is being asked to abolish so-called "safe country reviews"
Fifty organisations from across the UK who work with refugees have written to Home Secretary Amber Rudd calling on her to reverse a policy that they say is "beyond basic morality". Refugees will now take part in a "safe return review" five years after their refugee status is granted. The review will decide if refugees are able to stay in the UK or will return to their home country. The Home Office said it could not comment because of "purdah" rules. These limit government activity during the pre-election period. The department issued updated guidance on the process by which refugees already living in the UK apply to stay here permanently. Under the policy, all those who apply for settlement will be subject to a so-called "safe return review" to check the current situation in their home country. Campaigners claim the measures would "put an end to hope of stability" and end any possibility of refugees being able to integrate into society. Organisations that have signed the letter include Black Lives Matter UK, the Northern Ireland Community of Refugees and Asylum Seekers, the Scottish Refugee Council, Migrant Voice, Space4U Cardiff, Manchester Migrant Solidarity and Calais Action. Makhosi Sigabade, a refugee from Zimbabwe living in Belfast, was awarded refugee status in December. He told the BBC he was now facing an uncertain five years. "After being given a false sense of hope and stability, I am being made to relive the nightmares of my past," he said. Media captionMakhozi, a Zimbabwean refugee living in Belfast, told Peter Coulter how he felt when he heard. "I am now confronted with a possibility of going back to face the same persecution from which I fled. "I've been taking a Tefl [teaching English as a foreign language] course and trying to get work but with these changes I don't know if I'll be allowed to stay." Colin Harvey, professor of human rights at Queen's University Belfast, is one of the signatories to the letter. "These are troubling times," he said. "The very idea of human rights is under threat. "In times such as these we must stand together in support of the global regime of refugee protection and we must ensure that the rights of refugees are not undermined." 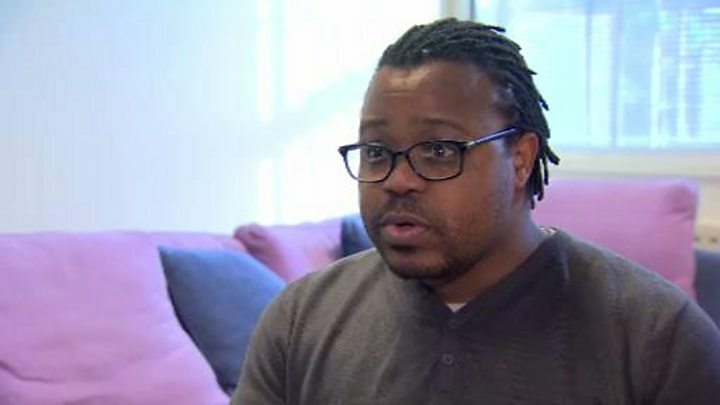 Luke Butterly, from the Belfast-based Participation and the Practice of Rights organisation which also signed the letter, said the new policy was "inhuman". "We're asking Amber Rudd to listen to the voices put forward in this letter and recognise that this policy will have a devastating impact on people's lives and will cost the Home Office an awful lot of money and serves no interest in the public good," he said. Home Office guidance states that "all those who apply for settlement protection after completing the appropriate probationary period of limited leave will be subject to a safe return review with reference to the country situation at the date the application is considered". "Those who still need protection at that point will normally qualify for settlement," it adds. They added that safe return reviews were introduced in February 2016. On Tuesday, the all-parliamentary group on refugees published a report saying thousands of refugees face homelessness and destitution because of a "two-tier" UK system.